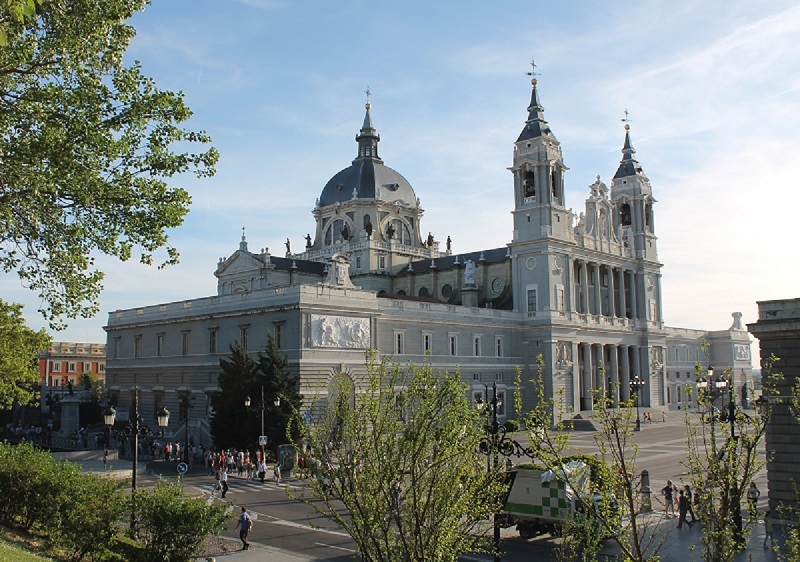 Although the Almudena Cathedral that we know now is a fairly recent construction, it hides a long history. It dates by 711 a.C when, due to the Muslim invasion, the few inhabitants of Madrid, hide in one of the stones of the city walls an image of the Virgin that they called “Santa María de La Vega “, or “La Concepción Admirable “. This was in an ancient temple that was erected where today is the Cathedral and which, after the Arab invasion, was converted into a mosque. Four centuries later, when King Alfonso VI reconquered the territory, he proposed to find the lost figure. According to legend, the King called a procession through the area of ​​the wall where it was believed that the image had been hidden, and miraculously one of the stones of the wall collapsed discovering the Virgin. It is believed that Alfonso VI himself had ordered to paint in the old temple, which was again Christian, an image of the Virgin holding a Fleur de Lis, which would have been the object of veneration of the Madrileños until the discovery of the Virgin de la Vega . The painting can be admired today in the Cathedral. As a curiosity it seems that the face of the Virgin is inspired by the wife of Alfonso VI, Doña Constanza, and that the Fleur de Lis alludes to the French origin of the Queen. Currently the “Virgin of the Fleur de Lis” is considered the patron saint of gardeners. On the other hand, it is not a mistake that the old Virgen de la Vega is now called Virgen de la Almudena. Actually this is also due to the Arab invasion. It is the Castilianization of the term “al-mudayna”, which means “city”. And hence its current name. After all, it took a long time until the work was undertaken to build the current cathedral of Almudena. So much that it was consecrated by Pope John Paul II himself in 1993, being the only one in Spain that has received such an honor. And surely after knowing these stories now you desire to pay a visit to our Cathedral. Well, it is really easy, because it is right in front of El Anciano Rey where, after the visit, you can take a well deserved snack.